Never slow down or miss a beat. The care we show people, it extends to our clients and their products too. 100% on-time performance If freight doesn’t arrive on time, then nothing else matters. So we ensure we have the team and tools to make your deliveries on schedule, every time. Thermo King refrigeration units A vast majority of what we ship requires specific temperatures to maintain freshness. We’re outfitted to accommodate those needs for any load we truck. Optional extended cargo insurance We take our cargo seriously, insuring whatever we truck and even providing extended insurance for high-dollar loads. National routes You want a trucking company that can get whatever you need to wherever it goes with no hassles or miscommunications. 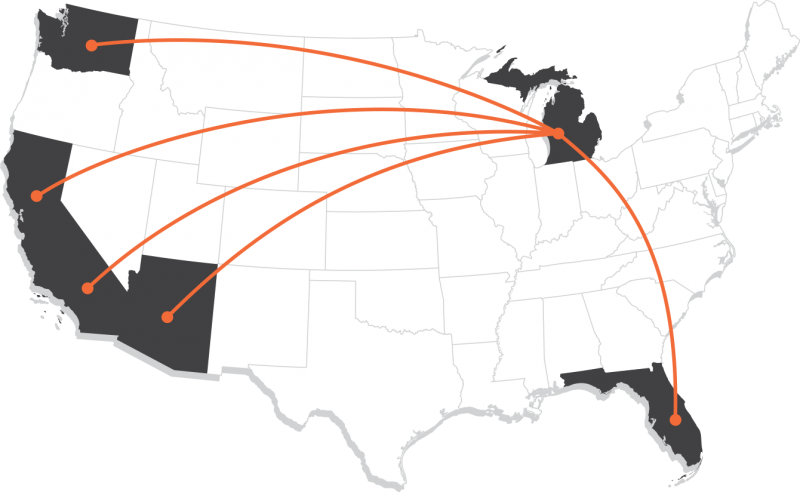 Our team is well-traveled and trained with routes that cross the nation so we can pick-up and drop off where you need. Tracking There’s a decided peace of mind that comes when you can follow the general movements of your shipment. That’s why we provide clients with trailers that possess some basic tracking. Find your destination along our standard routes throughout the Southeast, Southwest and Northwest. Michigan to Florida along I65 and I75. Michigan to Northern and Southern California along I80. Michigan to Arizona along various routes. Michigan to Washington along various routes.